The Regional Comprehensive Economic Partnership (RCEP), which was launched in November 2012, is currently under negotiation between ASEAN member states and their key dialogue partners (China, India, Japan, South Korea, Australia, and New Zealand), and has attracted headlines worldwide as among the key trading arrangements currently being negotiated. This mega-regional trade agreement, covering around 40 percent of global GDP and a two-thirds of world trade, is regarded as “beyond WTO trade deals.” The RCEP, in this regard, does not only cover market access for trade agendas that have also been negotiating under the current Doha Round trade negotiations but it has an even higher standard for those aspects. Some controversial trade agendas which were postponed for an indefinite period in the WTO trade negotiations, such as government procurement, state-owned enterprises, intellectual property rights, e-commerce, competition policy and also investment, managed to find their way into the RCEP talks. 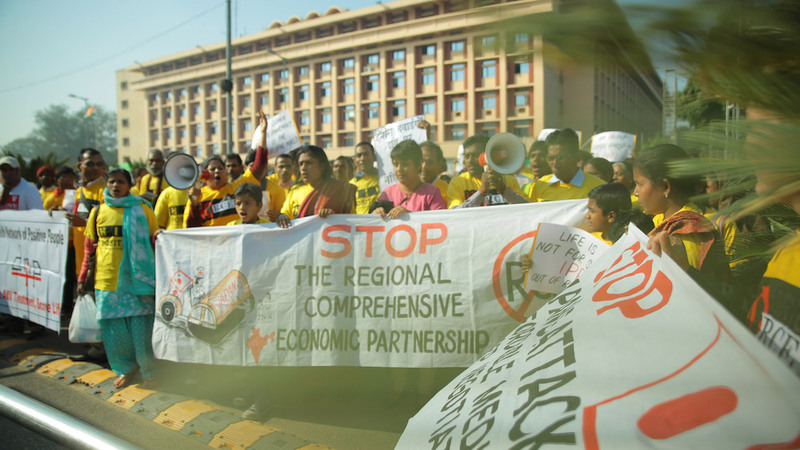 The RCEP negotiations also integrate non-WTO trade agendas such as provisions regarding small-medium enterprises and also Investor-State Dispute Settlement (ISDS). Among the issues being negotiated, intellectual property (IP) provisions are of particular concern for public health due to higher levels of protection which delay the market entry of generic medicines, translating to higher costs to governments and reduced access to essential medicines. In the Trans-Pacific Partnership (TPP) agreement, developed countries secured substantial TRIPS-Plus provisions including broadening the scope of patentability, patent term extension, data exclusivity, patent linkage, and stringent enforcement measures. Leaked RCEP proposals by Japan and South Korea dated October 3, 2014, indicated that these countries were seeking to elevate IP standard within RCEP to levels akin to those in the TPP. A more recently leaked composite draft of the RCEP IP chapter (dated October 15, 2015) showed that some of the Japanese and Korean proposals remained, at that time, under consideration and likely to be contested by at least some participants. However, the sheer magnitude of the economies of these two countries is such that they could shift the center of gravity within the negotiations in the direction of IP rights, especially given that seven of the 16 RCEP countries have recently signed up to unprecedented IP monopoly rights in the TPP. By the time ASEAN leaders adopted the Guiding Principles in August 2012, it became clear that the RCEP agreement would contain an IP chapter. Part V of those principles stated specifically that “the text on IP in the RCEP will aim to reduce IP-related barriers to trade and investment by promoting economic integration and cooperation in the utilization, protection, and enforcement of intellectual property rights (IPR).” Based on the 2015 leaded draft text, the IP chapter, which consists of 13 sections, shows provisions that go beyond the WTO-TRIPs agreement or “TRIPs Plus.” It not only adopts the basic principles of the TRIPs agreement on National Treatment, but also provides more stringent protection for IPR. TRIPs Plus provisions under Japan and South Korea’s proposal would affect access to medicine, including provisions for broadening the scope of patentability to explicitly allow for new forms and new uses of known substances, even when there is no evidence of enhanced efficacy ; patent term extensions to compensate for patent office or marketing approval delays, and data exclusivity. Whilst under the TRIPs agreement, a new invention can be granted a patent only if it can be proven as new and as an inventive step and capable of industrial application. Most of the RCEP countries do not provide for patents for new forms or new uses of known substances which do not result in an enhancement of known efficacy. In Indonesia, in fact, not all patents can be granted under patent law. Indeed, the obligation under the aforementioned draft text is in conflict with the interest of the Indonesian government especially to provide more affordable medicines for its people. The Indonesian government does not recognize the new definition of inventions under TRIPs Plus provisions. Recognizing these aspects to be patentable will expand the opportunity of pharmaceutical companies to protect their privileges. In addition, South Korea’s proposal also has a provision on patent terms adjustment in order to compensate unreasonable granting authority delays. Unreasonable delay is defined as a delay of more than four years from the date of filing of the application or three years after a request for examination of the application. Indonesia’s patent legislation does not have a procedure to expedite the examination of patent applications. Furthermore, there is no clause regarding compensation for unreasonable granting authority delays. The procedure to expedite the examination process can be beneficial since it can encourage more patent applications. However, on the other hand, the compensation mechanism for authority delays may also be regarded as extending the protection of patented products, which in turn benefits the existing patents owners. Japan’s proposal also includes new clauses on the protection of undisclosed test data submitted for marketing approvals. In the case of agricultural chemicals, it provides protections at least six years in the case of pharmaceuticals. The TRIPs agreement does not have such a requirement. In addition, flexibilities in IP law such as compulsory licensing could be rendered ineffective if this type of exclusivity is granted. This will arguably harm society’s interests since even after the end of patent protection, other companies cannot use “the undisclosed test or other data” that is supposed to be freely available and can be used to produce generic medicine. This is because, under the provision, it has to wait for at least six years after the end of its patents protection for the undisclosed test or other data to be freely used. This can also be regarded as a way to lengthen the period of virtual monopoly of pharmaceutical industries. Japan and South Korea have proposed TRIPS-Plus IP provisions for RCEP that, if adopted, would require changes to the patent laws of many developing countries including Indonesia, and likely delay the availability of generic medicines. In this regard, if Indonesia intends to join the RCEP, it is important to examine the extent to which Indonesia’s legal framework is compatible with those provisions. In addition, what is even more crucial is Indonesia’s commitment and capacity to provide social safety nets in protecting the public access to medicines. Ultimately, if trade negotiations are truly meant to benefit society, then they must be freed from their shrouds of secrecy and brought into the public domain. In this vein, a process for public oversight and input into RCEP’s negotiations must be urgently established. Otherwise, like many trade agreements before, RCEP will amount to corporate capture of Indonesia’s patent system. Eva Novi Karina is a lecturer at Pembangunan Nasional “Veteran” University, East Java and a researcher at Center for World Trade Studies (CWTS).